WHITTIER >> Police are seeking a driver who fatally struck a 69-year-old Whittier man who was out for a morning walk on Wednesday, then fled the scene, officials said. Kenneth Rawlings died after he was struck by a vehicle about 7:30 a.m. in the 16800 block of Janine Drive, just west of Macy Street, Whittier police Officer John Scoggins said. “The victim had been walking down Janine (Drive) when he was struck by the vehicle,” Scoggins said. Paramedics took the injured man to Whittier Hospital, where Scoggins said he succumbed to his injuries hours later. “We don’t have any direct witnesses at this point,” Scoggins said. A black Toyota Prius, “or similar-type vehicle,” was seen driving west along Janine Drive at high speed around the time of the deadly crash, according to Scoggins. Police had yet to determine whether that vehicle was involved in the collision, but wanted to speak with the driver to find out what information he or she may have. The victim lives near the crash scene and was out for a morning walk when he was struck, Scoggins said. Anyone with information is urged to contact Whittier police Officer Richard Jensen at 562-567-9261. The Whittier Police Department’s 24-hour tip line can be reached at 562-567-9299. 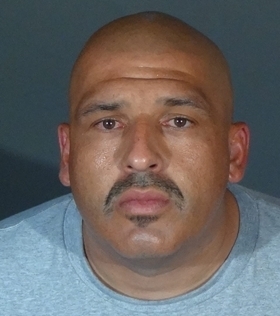 ALHAMBRA >> A Pasadena man is accused of vehicular manslaughter and hit-and-run for allegedly fatally striking a woman with his SUV and fleeing the scene, police said Wednesday. Erick Ulises Reyes-Melo, 28, of Pasadena was arrested hours after the collision, which took place about 1:50 p.m. on Tuesday at Main Street and Meridian Avenue, according to Alhambra police officials and Los Angeles County booking records. The pedestrian struck by the SUV, identified as 50-year-old Maria Salazar of Inglewood, succumbed to her injuries Wednesday morning at Huntington Hospital, Alhambra police Sgt. Steven Carr said in a written statement. Officers responded to reports of the collision and found Salazar “severely injured” at the scene, Carr said. “The striking vehicle, described by witnesses as a dark-colored SUV, had fled the scene,” the sergeant said. Within hours, investigators identified the involved SUV and the driver. Following the death of the victim, Reyes-Melo is now also expected to face a manslaughter charge, officials said. The investigation indicated Reyes-Melo’s SUV struck Salazar as he was making a left turn from northbound Meridian Avenue to westbound Main Street, according to car. Salazar was walking north across Main Avenue in a marked crosswalk. Intoxicated driving was not initially suspected, he said. PASADENA >> An Arcadia man in a pickup truck blew through a red light while drunk, injuring a man and girl in a crash, then fled the scene late Thursday, authorities said. Steve DiMartino, 46, was booked on suspicion of felony drunken driving and felony hit-and-run following the 11:05 p.m. crash at Green Street and Lake Avenue, Pasadena police Lt. John Mercado said. DiMartino was at the wheel of a pickup truck that ran a red light on eastbound Green Street at Lake Avenue and collided with a Honda sedan, according to the lieutenant. The driver of the Honda, a man in his 30s, and his passenger, a young girl, both suffered non-life-threatening injuries, he said. The man appeared to have suffered head injuries, and the girl’s injuries were included a bruised lung and lacerations to her face. The pickup truck fled the scene of the crash, police said. An off-duty police officer spotted the damaged car soon after, driving in the area of Washington Boulevard and Holliston Avenue, Mercado said. He thought the freshly damaged truck looked suspicious and reported the sighting to on-duty police. “On-duty officers responded to the scene, stopped the car and found that he was intoxicated,” Mercado said. According to county booking records, DiMartino was released from jail Friday afternoon pending his initial court appearance after posting $100,000 bail. GLENDORA >> Coroner’s officials have identified a 58-year-old Glendora man who was fatally struck by an alleged DUI, hit-and-run driver while working under the hood of a car last week. Brian Pasley succumbed to his injuries at a hospital shortly after the 10:10 a.m. crash on April 13 along Grand Avenue, just north of Arrow Highway, Los Angeles County Department of Medical Examiner-Coroner Assistant Chief of Operations Ed Winter said. He was working on auto repairs along the side of the road when a Scion xB driven by 29-year-old Mark Stephen Gagliardi of Claremont slammed into the rear of the car Pasley was working on, Glendora police Cpl. Bill Lee said at the time. Gagliardi fled the scene, but was found and arrested nearby after his damaged car broke down less than half a mile away, Lee said. Investigators determined Gagliardi was driving while intoxicated and arrested him on suspicion of vehicular manslaughter, felony DUI and hit-and-run, according to the corporal. According to Los Angeles County booking records, Gagliardi was released from jail pending his initial court appearance after posting $136,000 bail. GLENDORA >> A Claremont man is accused of manslaughter, DUI and hit-and-run after he crashed his car into a parked car early Thursday, killing a man who was working under the hood, authorities said. Mark Stephen Gagliardi, 29, was jailed in connection with the 10:10 a.m. crash along Grand Avenue, just north of Arrow Highway, according to Glendora police officials and Los Angeles County booking records. The victim, a 59-year-old Glendora man whose name was not available, was working on his car, which was parked along the east curbline of Grand Avenue, prior to the crash, Glendora police Cpl. Bill Lee said. Gagliardi was northbound on Grand Avenue when his Scion xB veered toward the side of the road and rear-ended the victim’s parked vehicle, according to the corporal. The impact pushed the victim’s vehicle forward, crushing him between his own vehicle and another vehicle parked in front of it. Paramedics treated the badly injured man at the scene and took him to a hospital, where he succumbed to his injuries a short time later, Lee said. The driver, later identified as Gagliardi, tried to drive away, Lee said. But his car, which was damaged in the collision, broke down less than half a mile away. Officers arrested him without a struggle. Gagliardi was ultimately booked on suspicion of vehicular manslaughter, DUI and felony hit-and-run, Lee said. According to county booking records, Gagliardi was being held in lieu of $136,000 bail pending his initial court appearance. PICO RIVERA >> Deputies jailed a Pico Rivera woman on Friday morning after she fatally struck a bicyclist on Rosemead Boulevard, then fled the scene, hours earlier, authorities said. The bicyclist, a woman whose identity has not been released, was riding her bike on Rosemead Boulevard south of Rex Road at about 2 a.m. when she was hit, Sgt. Wilson Wong said in a written statement. The victim, whom the coroner’s office believes was in her 30s, was taken to a local hospital where she died of her injuries, according to Ed Winter, assistant chief of Operations at the Los Angeles County Department of Medical Examiner-Coroner. 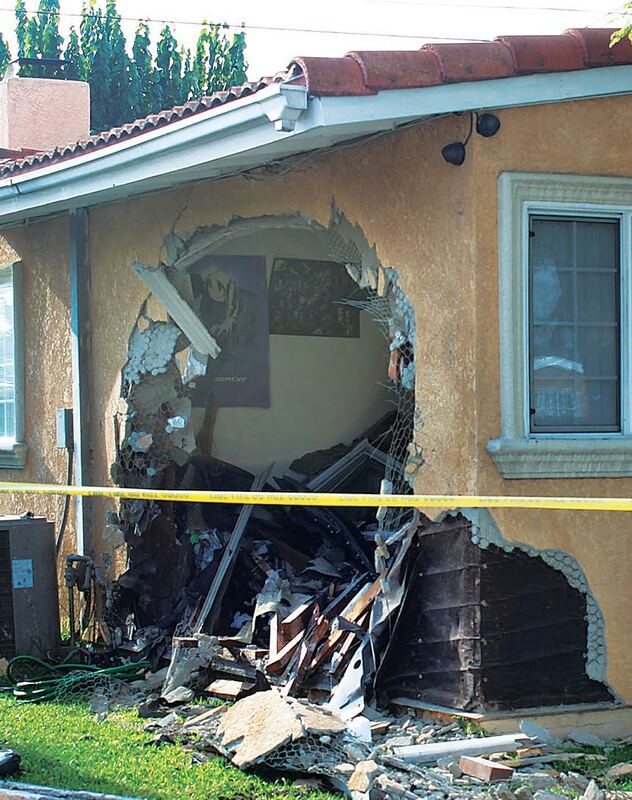 LA PUENTE >> An 18-year-old man accused of crashing his father’s Mercedes-Benz through a La Puente bedroom in which to children were sleeping early Wednesday, then running away, turned himself in to deputies late in the day, authorities said Thursday. The crash took place about 1:45 a.m. at Temple and Duff avenues, Los Angeles County sheriff’s Deputy Michael Lang said. A 2015 Mercedes-Benz C300 was eastbound on Temple Avenue when it veered to the side of the road, crashed through a fence and plowed through the side of a house, Lang said. Two children sleeping inside the room penetrated by the car were unhurt, Lang said. The driver got out of the car and ran away, officials said. He left his tennis shoes behind in the car as he fled. The 18-year-old suspect showed up at the sheriff’s Industry Station Wednesday afternoon with his father and turned himself in, Sgt. Gina Eguia said. The car turned out to belong to his father. Deputies issued the driver a misdemeanor citation for hit-and-run, she said. His name was not available Thursday afternoon. 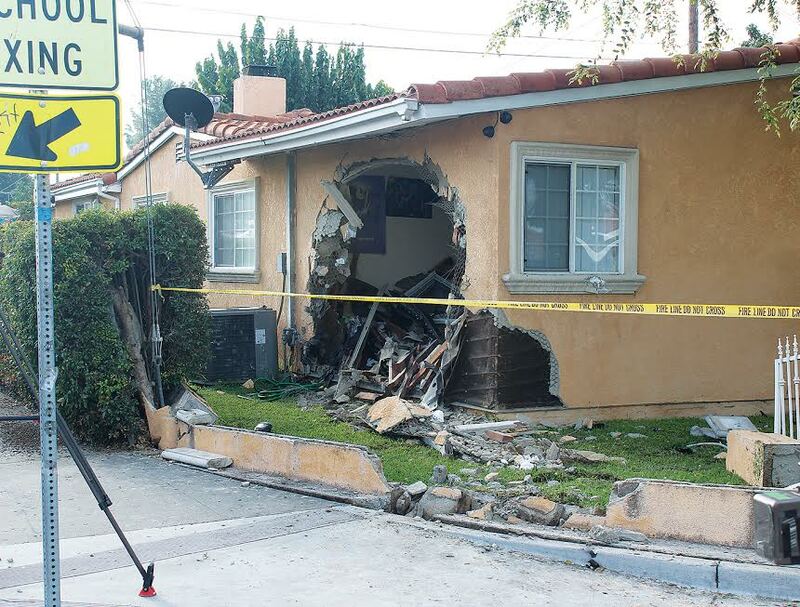 LA PUENTE >> Two children escaped injury when a car plowed through their bedroom in La Puente early Wednesday morning, authorities said. The driver ran away and remained at-large Wednesday afternoon. The crash took place about 1:45 a.m. at the corner of Temple and Duff avenues, Los Angeles County sheriff’s Deputy Michael Lang said. A 2015-Mercedes-Benz C300 was eastbound on Temple Avenue when the driver lost control, the deputy said. The car struck the curb or wheelchair ramp, then smashed through a fence and into the side of the home. The vehicle ended up embedded about halfway into the bedroom, in which two children were sleeping, Lang said. Neither child was injured. The driver abandoned the wrecked Mercedes and fled the scene on foot, Lang said. He was initially described as a man between 20 and 25 years old. The crash was caught on video by a nearby surveillance camera, Lang said. Investigators were working to obtain a copy of the recording. Deputies continued seeking the driver, as well as the registered owner, of the car Wednesday afternoon. Lang urged the driver to turn himself in. Anyone with information can reach the sheriff’s Industry Station at 626-330-3322. Authorities arrested an 18-year-old Montebello man who they say fatally struck a bicyclist with an SUV before fleeing the scene, crashing into several parked cars and ultimately being detained by neighborhood residents until police arrived. John F. Saldivar, 18, is accused of hit-and-run in connection with the fatal collision, which took place about 7:30 p.m. on Concourse Avenue, just south of Allston Street, on the border between East Los Angeles and Montebello, according to Officer E. Anguiano of the CHP’s East Los Angeles-area office. The bicyclist, described as a 35-year-old Los Angeles man, died at the scene, officials said. His identity was not available Sunday. Saldivar was driving a 2002 Ford Expedition south on Concourse Avenue prior to the collision, Anguiano said. The bicyclist was also southbound, traveling ahead of the SUV. “For unknown reasons, (Saldivar) failed to notice the bicyclist ahead and collided with the bicyclist,” Anguiano said in a written statement. The cyclist was thrown from his bicycle. The driver allegedly fled before crashing into several parked cars a few blocks away. “(Saldivar) was detained by local residents until CHP arrived on scene,” Anguiano said. Intoxicated driving was not believed to a factor in the crash, he added. Any witnesses are encouraged to contact the CHP’s East Los Angeles-area office at 323-980-4600.